I will first report the main findings of an eye-tracking study (Staub, Foppolo, Donati and Cecchetto 2018, Journal of memory and language) which investigates the processing of syntactic ambiguity in strings such as “the information that the health department provided (a cure) reassured the tour operators”, where the that-clause can be either a relative clause involving movement of the head noun (the information) from the object position after “provided” (RC : “the information that the health department provided __”) or the clausal complement of the noun (CC : “the information that the health department provided a cure). Staub et al. showed that CC constructions were preferred and this preference was not modulated either by frequency of RCs with respect to CCs (RCs are exceedingly more frequent than CCs) or by frequency biases towards CC or RC continuation of the nouns followed by CC or RC. Staub et al. attribute the preference for RCs to the Minimal Chain Principle (De Vincenzi, 1991), which states that filler-gap dependencies should not be posited except when necessary. However, a limitation of Staub et al.’s study is the fact that the two structures tested (CC vs. RCs) also differed in the attachment site of the critical clause (complement vs. adjunct in traditional terms). Thus, an explanation in terms of Minimal Attachment (Frazier 1978) is also plausible. 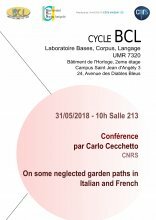 To further investigate this question, we report on-going work on two temporarily ambiguous structures in Italian and in French that only differ with respect to the presence/absence of the filler-gap dependency. In (1c), the verb (in this case, “chiedere”, to ask) unambiguously selects an IQ : for this reason, a gap after the main verb is obligatory in (1c). Again, Minimal Attachment does not distinguish (2a) and (2b), as both contain a CC. The two sentences, however, differ in the role of ce que : in (2b) it introduces a free relative (FR), thus postulating a gap is required. In (2a), instead, ce que is just a variant of the complementizer que and the sentence contains no gap. As a control, we also compared sentences (2a-b) with sentence (2c), with a verb (here “voir”, to see) that unambiguously selects a free relative. We conducted two acceptability judgment studies with 68 adult Italian participants and 70 adult French participants. The results both in Italian and in French show a preference for sentences (a), that include a declarative complement clause with no gap, over sentences (b), which contain a gap (as an indirect question or a free relative). An explanation in terms of Minimal Chain Principle seems to be needed.